The guidelines (2007), published in Circulation: Journal of the American Heart Association, are based on a growing body of scientific evidence that shows that, for most people, the risks of taking prophylaxis antibiotics for certain procedures outweigh the benefits. These guidelines represent a major change in philosophy. Only the people at greatest risk of bad outcomes from infective endocarditis — an infection of the heart's inner lining or the heart valves — should receive short-term preventive antibiotics before common, routine dental and medical procedures. a cardiac transplant which develops a problem in a heart valve. ** Prophylaxis is reasonable because endothelialization of prosthetic material occurs within 6 months after the procedure. non-dental procedures: shedding of deciduous teeth, bleeding from trauma to the lips or oral mucosa. prophylactic antimicrobial therapy should be directed against viridans group streptococci. If the dosage of antibiotic is inadvertently not administered before the procedure, the dosage may be administered up to 2 hours after the procedure. However, administration of the dosage after the procedure should be considered only when the patient did not receive the pre-procedure dose. Some patients who are scheduled for an invasive procedure may have a coincidental endocarditis. The presence of fever or other manifestations of systemic infection should alert the provider to the possibility of IE. In these circumstances, it is important to obtain blood cultures and other relevant tests before administration of antibiotics intended to prevent IE. Failure to do so may result in delay in diagnosis or treatment of a concomitant case of IE. In Table 5, amoxicillin is the preferred choice for oral therapy because it is well absorbed in the GI tract and provides high and sustained serum concentrations. if allergic to penicillins or amoxicillin, the use of cephalexin or another first-generation oral cephalosporin, clindamycin, azithromycin, or clarithromycin is recommended. Even though cephalexin was less active against viridans group streptococci than other first-generation oral cephalosporins in 1 study,136 cephalexin is included in Table 5. No data show superiority of 1 oral cephalosporin over another for prevention of IE, and generic cephalexin is widely available and relatively inexpensive. Because of possible cross-reactions, a cephalosporin should not be administered to patients with a history of anaphylaxis, angioedema, or urticaria after treatment with any form of penicillin, including ampicillin or amoxicillin. Patients who are unable to tolerate an oral antibiotic may be treated with ampicillin, ceftriaxone, or cefazolin administered intramuscularly or intravenously. 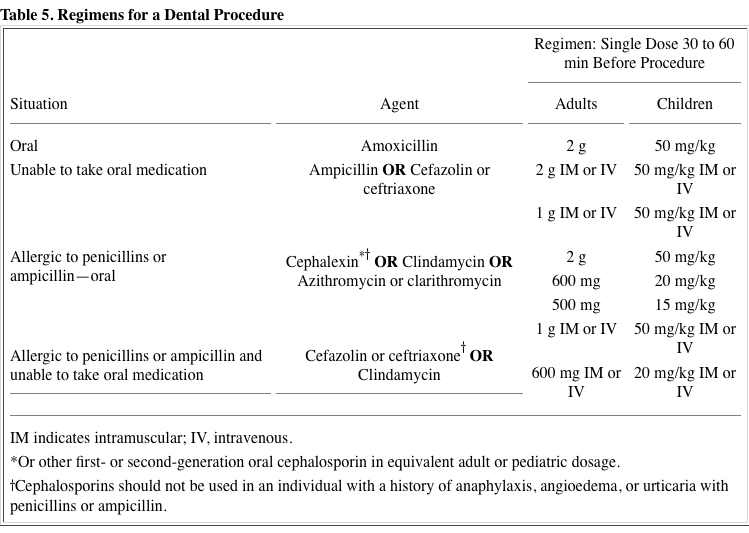 For ampicillin-allergic patients who are unable to tolerate an oral agent, therapy is recommended with parenteral cefazolin, ceftriaxone, or clindamycin.